In 2010 Warrington Borough Council began a social housing PV programme aimed at tackling fuel poverty. Since then the scheme has delivered 3.595MW of solar PV across 3,001 social homes and three sheltered housing schemes as well as 222kW of PV on schools, a crematorium, offices and even the local rugby stadium. Confident in the technology, WBC decided in 2014 to look into the potential of larger PV arrays. An OJEU compliant framework for large scale installations has been set up, andthe first two large commercial projects totalling 1.5MWp are now being developed with installation anticipated in the first half of 2016. The non-domestic projects are anticipated to return over £2.3m to the council over the next 20 years and save over 13,000 tonnes of CO2 emissions. 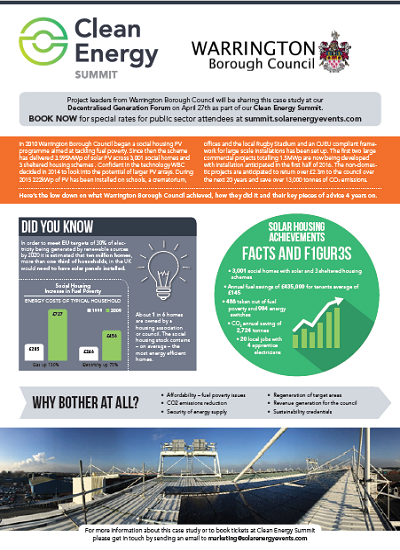 Here’s the low down on what Warrington Borough Council achieved, how they did it and their checklists for success for solar PV projects. Join Rebecca Warren, Green Energy Consultant and Danny Mather, Corporate Finance Manager at the Distributed Generation Forum on Wednesday April 27, 2016 for an in-depth talk on Warrington Borough Council's PV projects (this session is open only to public sector staff).